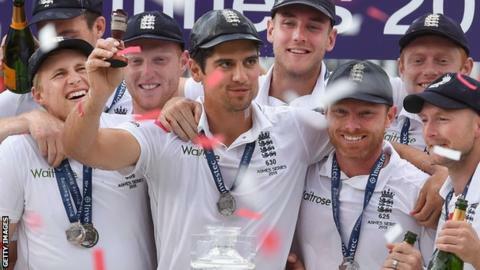 England's defence of the Ashes begins at 00:00 GMT on Thursday when the first Test against Australia gets under way in Brisbane. The tourists are the holders of the famous urn, but Australia are favourites to win the five-Test series on home turf. Test Match Special will provide ball-by-ball commentary of all Tests on BBC Radio 5 live sports extra, Radio 4 LW and online via the BBC Sport website and app. There will be live text commentary on the BBC Sport website, featuring analysis, debate, images and the best of social media. The estate agent in charge of England - who is the real Trevor Bayliss? On TMS, cricket correspondent Jonathan Agnew will be joined by a host of former players, including Ashes-winning former England captain Michael Vaughan, ex-batsman Geoffrey Boycott - recently named in BBC Sport users' all-time Ashes XI - former spinner Graeme Swann and legendary Australia seamer Glenn McGrath. For those who may have missed the action, Pint-Sized TMS will bring you the best moments from on the field and in the commentary box. There will also be a daily TMS podcast and a highlights programme during the Tests, and you can tune in to Radio 5 live's Ashes breakfast show from down under for all the latest reaction. You can get push alerts sent to your phone so you can follow all the wickets as they happen and find out the latest Ashes news. The term Ashes was coined on 29 August 1882 after England lost a Test to Australia for the first time on home soil, which led to the Sporting Times publishing a mock obituary of English cricket the next day. The obituary concluded that "the body will be cremated and the ashes taken to Australia", with an urn presented to England captain Ivo Bligh later that year after his side beat Australia at home. The Ashes is now a five-Test series, hosted in turn by England and Australia at least once every four years. Both teams have won 32 series each, with five series finishing as draws - but England have been whitewashed 5-0 on three occasions, including twice in the past three tours. England hold the Ashes after a 3-2 victory on home soil in 2015. How hard will it be for England? England were victorious in 2010-11 but lost 5-0 in the away series before and after that win. They are clear underdogs this time, according to the bookmakers. They have travelled to Australia unsure of their best side. All-rounder Ben Stokes remains in England as he awaits the outcome of a police investigation into an incident outside a Bristol nightclub. England do not have a settled batsman at number three or five, and nine members of the 16-man squad have not played a Test in Australia. The bowling attack is slightly more settled, although injury ended Steven Finn's tour before a match had been played - he was originally called up to replace Stokes - while Toby Roland-Jones' hopes of travelling to Australia were ended in September. England drew two of their three warm-up games before the first Test, although results have largely been overshadowed by the usual war of words that accompanies an Ashes series. Read more on The estate agent in charge of England - who is the real Trevor Bayliss?